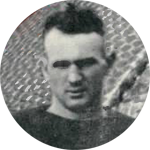 The 1920 Staley team had at least six non-college players, but the only one from outside the Decatur area was Andy “The Fly” Feichtinger. Whether he was recruited or just showed up one day is a mystery. An article in the Oregon Daily Journal that November announced that he was playing professional football “with the Decatur, Ill., aggregation,” and that “Andy always has had ambition to play in the same league with Jim Thorpe, the famous Indian star, and now they have been realized.” The article went on to say that “Andy said that he was up against a stiff proposition in landing a position on the Decatur lineup inasmuch as the end position he was after was assigned to the captain of the squad,” that being George Halas. Feichtinger started at end in the first two 1920 games for Staley before Guy Chamberlin arrived and when Halas was injured. The second game of the season ended on Staley Field as Andy snared a 40-yard pass from half back Jimmy Conzelman. In all, he played in four games that season and made twice as much money as any of the other non-college players. He started working in the plant by September 1920 and also played on the baseball team with Halas. Andy grew up in Oregon and was working in a shoe factory by the time he was 15 years old. Before coming to Staley he had been a chauffeur for several years, then a “ship rigger” and finally a truck driver. Somewhere in his youth he learned to play football as he was a star end in Portland, Oregon on the famous Multnomah Athletic Club football teams in 1917, 1918 and 1919. Some say he was the only non-college player on a club team that played mostly college teams in the Pacific Northwest. After one season in Decatur he returned home and played several years of semi-pro baseball. On August 26, 1924 he married Ellen “Nell” Holland and became a plumber in the Coos Bay area for the rest of his life. He returned to Illinois to attend the Staley Day honors in Chicago in October 1956, traveling farther than any of his teammates. When interviewed at the banquet after the Bears game by Decatur sports writer Forrest Kyle, Andy said: “I wanted to come to Chicago and meet Mr. Staley and Mr. Chamberlain. I wouldn’t trade the trip for anything in my life.” Feichtinger [whose name was misspelled on the famous 1920 team photo] passed away in 1962 at the age of 65 and rests in Sunset Cemetery in Coos Bay.